2017/2018 season sees Colemanstown United F.C. field 4 No. teams in competitions at local, regional & national level. These comprise u12 & u14 age groups and 2 No. adult junior teams (A team and Reserve). In addition to the above, we will also have a strong academy from U7 – U11 who are engaged in internal mini leagues hosted by various clubs while we also participate in the U11 South Galway Development League. 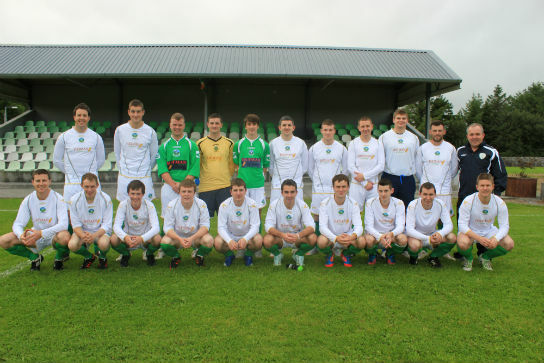 Our club colours are green & white; we currently wear a green jersey, white togs & green socks. The club membership is primarily drawn from an 8mile radius of Colemanstown & its environs. Our ethos is concerned with the development of young players and with contributing in a positive manner to our local community who have supported us financially and otherwise down through the years since the club’s foundation. Colemanstown United F.C. wish to acknowledge Frank & Bernie Burke & family as the main club sponsors. Also thanks to Gerry & Marguerite Moran, Hatman of Ireland, for their generous sponsorship of jerseys for all our teams down through the years, to Derek Laffey of Roll-a-Door for his sponsorship of jerseys and to Sharon and Gary Noone for sponsoring togs for our current U14 team for the past 3 years. We must also acknowledge the financial assistance of Ballymacward Hall Committee down through the years and whose continued generous financial contributions make running our club a reality. Thanks also to Brian Griffin and PJ Connell of GRD and supervisor Ita Kenny who keep everything afloat in our club grounds, pitch and clubhouse and whose efforts do not go unnoticed.